Medical research attracts broad community support for some very good reasons. It is essential for a high quality health care system - we are lucky in Australia to have healthcare equal to the best anywhere in the world. On an individual level, it provides the hope we all have that science will bring cures for our loved ones with serious illnesses. In addition, it is an important industry for the nation as we carve out a future in advanced technology in addition to our existing strength in mining and agriculture. We are very grateful for the Federal Government’s support for medical research and the support of the Opposition, the Greens and the Palmer United Party. That is, we have quadripartisan support – even better than bipartisan. Despite this remarkable consensus it has been very difficult for the Medical Research Future Fund to pass through the Senate where in theory increased support for medical research might be welcomed. We really need the Fund in order to ensure Australia’s continuing international success in medical research. We hope you too recognise how crucial this support is. Recently, Graeme Samuel AC has been Chairing the Review to Strengthen Independent Medical Research Institutes, a process that has provoked much discussion. Perhaps the main conclusion from the most recent meeting was that institutes like SVI should be working closely with hospitals and universities and participate in hubs and other collaborative structures, especially with a view to translating research outcomes. It is very gratifying that we have been so actively engaged in building bridges with St Vincent’s Hospital and The University of Melbourne over the past decade, positioning us well to satisfy these requirements. The vision for the Aikenhead Centre for Medical Discovery is as a hub on the St Vincent’s Campus that will aid collaboration, clinical translation and relationships with industry. There is very encouraging progress with securing funding for the building and also a great deal of work being done on bringing the existing institutions closer together. I look forward to keeping you updated about this exciting project. Medical research is a collaborative endeavor. Those working at the coalface do not always get the glory, but Australia’s research assistants, technicians and students are critical to our medical research success. There are 44 research assistants and technicians at SVI, representing about a quarter of the Institute’s total staff. SVI’s research assistants are a loyal bunch: the three longest serving research assistants have 79 years of service to SVI between them. SVI currently has 38 undergraduate and postgraduate students. Since 1990, more than 60 PhD students have graduated from SVI. These SVI alumni have gone on to work in labs as far flung as Canada and Germany. SVI's current serving research assistants and technicians have a total of 271 years of collective service to SVI. Although rarely lauded outside of the laboratory, research assistants and technicians are fundamental to medical research. They are multi-tasking, problem-solving, level-headed facilitators. They make order out of lab chaos by collating and managing collections of specimens and complicated data outputs. They are often responsible for the day-to-day training of new people who join the group: the successes of students are often directly attributable to the quality of the oversight they received from the lab’s battle-weary research assistants. They are one of the few constants in laboratories, providing continuity as students and postdocs transit through the lab and move out into the research world, bolstered by the training they have received. SVI is lucky to have an excellent group of expert research assistants, some of whom have worked at the Institute for the majority of their careers. Here we highlight the importance of their role by focusing on just four of SVI's 44 hard-working research assistants. Next time you hear of a medical breakthrough in the media, take a moment to think of the people who may not front the press conference, but whose work behind the scenes is indispensable. The 2015 round of SVI Student Scholarships has recently been awarded to five PhD students and three Honours students. Made possible thanks to the generous contributions from the SVI Support Group, the Top-up Scholarships provide an additional $5,000 per year to the stipends of SVI’s top students, allowing them to devote more of their attention to their studies. The 2015 awards were made to PhD candidates Karen Cheung (supervised by Professor Michael Parker), Claudia Selck (Dr Bala Krishnamurthy), Julienne O’Rourke (Dr Andrew Deans), William Stanley (Dr Esteban Gurzov) and Christina Vrahnas (A/Prof Natalie Sims). Evan Pappas, Jasmina Markulic and Justin Galvin were awarded Honours Scholarships. The students will be working on a range of projects, including developing new treatments for leukemia and osteoporosis, harnessing the immune system to prevent autoimmune disease and understanding the pathways of cell death that lead to type 1 diabetes. The 2015 awards brings to 59 the total number of students supported since the inception of the SVI Foundation Top-up Scholarships in 1989. Dr Michelle Ashton, Dr Hayley O’Neill and Dr David Ascher are three grateful past recipients of the SVI Foundation Top-up Scholarship Program. Having completed her PhD in 2013, Dr Michelle Ashton is now working as a postdoctoral researcher at the DFG-Center for Regenerative Therapies in Dresden, Germany. Dr Hayley O’Neill is currently an NHMRC Peter Doherty Early Career Fellow at Bond University, Faculty of Health Science and Medicine, Bond Institute of Health and Sport (BIHS) in Queensland. Dr David Ascher is currently working with Professor Sir Tom Blundell in the Department of Biochemistry at the University of Cambridge. As these testimonials demonstrate, the SVI Support Group’s fundraising efforts to support PhD students go a long way to providing these young Australians with the best foundation upon which they can build life-changing discoveries. Dr Lorien Parker, a former SVI PhD student and recipient of the 2010 TJ Martin Medal, recently arrived back in Australia to continue her work with Professor Michael Parker in the Structural Biology Unit. Lorien spent the last 4 years at RIKEN Laboratories in Yokohama, Japan, where her studies focused on designing new inhibitors of human cancers as well as inhibitors for proteins involved in metabolic disease. My childhood ambition was…to have a lot of cats and be a vet. Now, I've got one cat and had to give him medicine once, so I 'spose I'm halfway there! My first job was…working at Shock Records in Northcote. It was like the movie Empire records, but without all the exciting bits. My worst job was…I actually haven’t had a bad job yet, so I consider myself pretty lucky. I got into research because…I like to understand how things work and why they happen. The hardest thing I have ever done was…build a house with a 4 month old. My scientific role models are…people who are successful in science but not at the cost of their family or social life. I know many wonderful researchers who have incredible track records at the same time as having a young family. I find it really refreshing and inspiring to see people who manage to succeed at both (without losing their minds). If I wasn't doing research, I would…probably get pretty bored, although I think at least a few months of sleeping in and kicking back during the day wouldn't be too hard to tolerate. If I could live anywhere I would choose…Japan (again). Beautiful place, wonderful people and amazing food. “Gnarled female hands were the norm for me when I was a child. I did not know that they were part of a medical condition that I was to inherit. Both of my grandmothers had knotty, uncomfortable hands yet both women worked uncomplainingly. My mother played beautiful Chopin and Beethoven on the piano, stretching her arthritic fingers an octave or more. My time came when I was 45 years old. The first indication was a strange clicking sensation in one finger, then another. Over the next 10 years the unmistakable Heberden's nodes of osteoarthritis appeared. Further down the track my feet began to manifest the same misshapen form. Both hands and feet developed stiffness on top of deformity. Some loss of function, or at least reduced function, then began to challenge me. As I have always loved and lived an active, outdoors life, I have not been deterred, until a spinal condition was added to the skeletal scene in 2011 – spinal stenosis and a disc problem. All in all I had to accept that I was diagnosed with degenerative processes. Not so acceptable when one has a rural existence and when manual activity is my daily choice and routine. I have had foot and spinal surgery. I am on anti-inflammatory medication. It provides some relief, but I am constantly reminded of that term – ‘degenerative’. However, I intend to be active, to ride my horses, prune my roses, run with the dog and clean my own gutters for as long as I can. I have strong links to science and have always been interested in how to manage my own health. It would be wonderful if medical research could deliver a means to halt the progress of, if not to reverse, my arthritis." By studying the cells whose job it is to build and destroy bone, and the way these cells interact with each other, researchers in SVI’s Bone Cell Biology and Disease Unit are working to find new treatments for arthritis and osteoporosis. The Jack Holt Society Morning Tea was held on Friday December 5 in the Bourke Room of Melbourne’s The Hotel Windsor, also known as the “Duchess of Spring Street”. The event was attended by over 50 guests, including members of the Jack Holt Society, as well as other SVI supporters. The Society was only launched at the end of 2012, so this event was just the third formal gathering organised to allow the group to learn more about research at the Institute. SVI’s Associate Professor Jock Campbell spoke about his heart disease research at the Institute and highlighted how it would not be possible without philanthropic support. Chair of the SVI Foundation and long-term supporter Susan Alberti shared her passion for type 1 diabetes research, and told the story of how she first became involved with SVI over 11 years ago. Kathy Wilson, a Special Counsel in Aitken Partner’s Wills, Estates and Succession team, addressed the basic steps of including a charity in your will. The Patron of the Jack Holt Society, Gerald Snowden, shared some of his personal story and explained how he took over 40 guests on tours through the Institute in 2014 alone. Over the past 12 months, SVI has had 10 confirmations from people indicating they are including SVI in their Will, raising the Jack Holt Society membership numbers to 20. If you are interested in leaving a bequest to SVI and joining The Jack Holt Society please contact the SVI Foundation on (03) 9231 2480. SVI is proud to present our third annual Food Matters Event on Tuesday March 31. This event focuses on the role of food and diet in our society and its impact on disease. Australians are carrying a combined total of 180,000 tonnes of excess weight, an increase of 30,000 tonnes since 2008. Australians are gaining 5,000 tonnes per year. Around 11 million Australians are overweight by an average of 16.5 kilograms, which can have a dramatic effect on health and wellness. Following their presentations, they will be joined for a Q&A session by researchers from SVI’s Protein Chemistry and Metabolism Unit. SVI Board member and renowned Melbourne dietitian Karen Inge will be the MC for the evening. The event kicks off on Tuesday March 31 with a tour of SVI from 5.30 to 6.15pm. Drinks, canapés and speakers will follow with proceedings closing at 8pm. For more information contact Lara on (03) 9231 2480. RSVPs close Friday March 27. People from around Victoria are supporting SVI just by shopping at their local Ritchies supermarket. By using their Ritchies Community Benefit card linked to SVI when they shop, a donation is made to support SVI’s research into diseases that affect many Australian families. Several thousand dollars has been raised for SVI since joining Ritchies Community Benefit program in 2001. If you would like to support SVI and you don’t already have a Community Benefit card, collect one at the register next time you shop at any Ritchies store. All you need to do is nominate St Vincent’s Institute of Medical Research. Use your card every time you shop; even if you only purchase a couple of items, it all adds up. For the last 2 years, the Susan Alberti Medical Research Foundation’s Mother’s Day Luncheon has raised vital funds to support the careers of women in research at SVI. Money raised at the Luncheon supports the Susan Alberti Women in Research Award. The Award supports the work of an outstanding female scientist at SVI, by helping to alleviate the adverse impact on her research caused by the family responsibilities that come with having a baby. The most crucial years in a female researcher’s career often coincide with childbearing and raising small children. The Award provides funds to pay a research assistant or postdoctoral fellow to continue the recipient’s work in the lab while she is on maternity leave or working part-time. Now in its third year, the event is further evidence of Susan Alberti’s untiring support of medical research and addresses an issue close to her heart: helping outstanding women to excel. Dr Sophie Broughton was the 2014 recipient of the Women in Research Award. Sophie is the proud mother of Alexander, 15 months. We sat down with Sophie to discuss what receiving the Women in Research Award meant to her. Why is the Women in Research Award unique? The Award gave me the opportunity to keep up with my research career without sacrificing time with Alexander when he was a baby. What did receiving the award mean to you? I was concerned that during my time off my career would suffer. Maintaining momentum in your career is so important during the early years of a postdoc. This award has given me an advantage in that my work was able to continue in my absence and when I returned I could just jump straight back in. It was great that I could just enjoy motherhood and know that I was still able to progress in my career. What are the challenges of working in medical research and how do you overcome them? Generally speaking I think job security is a key issue. Most researchers are funded for only 1-5 years and there is constant effort required to secure funding for the future, and the competition for funding is fierce. This is why it is important for researchers to be consistently producing results and not have a significant gap in their productivity. There can also be challenges when you return to work as a parent of young children, how do you overcome these? Personally I find the lack of sleep challenging. I love my sleep and I really miss it! I also find that I need to be more organised and efficient, as I can no longer just work later in the evening to catch up. It's all worth it though, he's such a beautiful little boy! 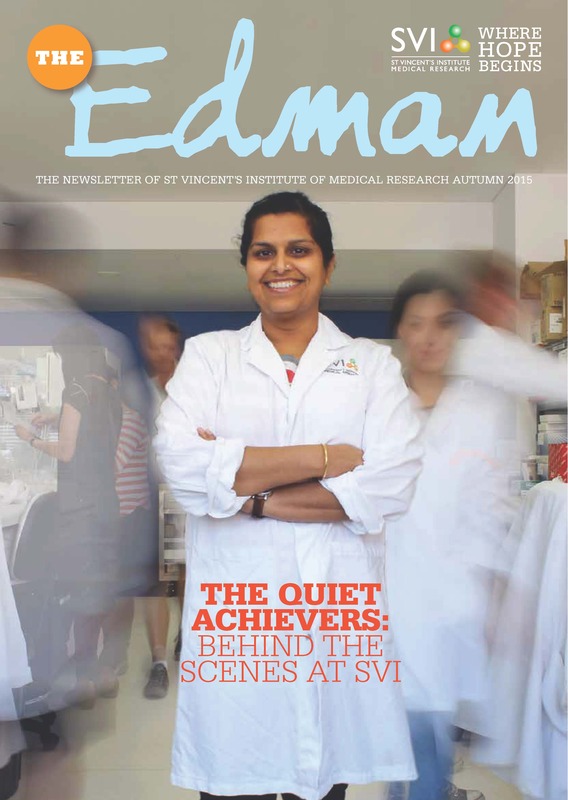 I'm lucky too that SVI is a very supportive environment for working mothers; this is especially due to my colleagues in the lab helping me along the way. My husband is also a very hands-on dad, which is great. I was able to solve the three-dimensional structure of an antibody bound to an important protein involved in leukemia. This antibody is now in clinical trials and my structure gave important information on how the antibody was able to function. As a result of this work I have won three prizes over the last year or so (mainly while on maternity leave!) and been invited to give two presentations. I'm proud that I might have contributed to treatments that will improve patient outcomes. What keeps you motivated in your role as a researcher? I like finding answers to questions. I love it when I have new data and can finally see the three-dimensional structure of a protein for the first time. It's a great feeling and can give you so much new and exciting information. Yes, I know, I'm a total nerd! This year’s event will be held on Thursday May 7th, with guest speaker Dr Judith Slocombe. As a successful businesswoman, CEO of the Alannah and Madeline Foundation and mother of nine children, Dr Slocombe understands the issues faced by women with careers and children.